View More In Telescope & Microscope Accessories. This big 2 inch Barlow lens will give your 2 inch telescope eyepieces a 2x magnification boost with amazing image quality. 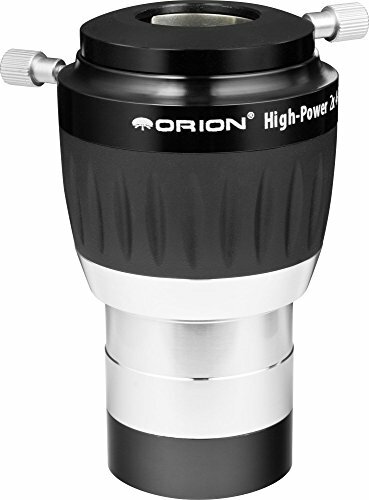 The Orion High-Power 2 inch 2x 4-Element Barlow Lens provides superior performance compared to standard Barlow lenses thanks to its deluxe features and 4-element design which minimizes chromatic and spherical aberrations while preserving image sharpness and contrast. As its name implies, the High-Power 2 inch 2x Barlow doubles the magnifying power of any 2 inch eyepiece, essentially dividing the eyepiece's focal length by a factor of 2. For example: using a 42mm eyepiece in the High-Power 2x Barlow provides the same magnification you'd normally get from a 21mm eyepiece (42 / 2 = 21). Using this simple formula, you can easily determine how each of your 2 inch telescope eyepieces will perform when inserted in the High-Power 2x 4-Element Barlow Lens. An included 2 inch-to-1.25 inch step-down adapter allows use of both smaller 1.25 inch eyepieces and big 2 inch oculars with the versatile Orion High-Power 2 inch 2x Barlow Lens. Since the Orion High-Power 2x Barlow features a sophisticated, 4-element, fully multi-coated lens design, it will provide better color correction and less distortion than 2- or 3-element Barlows. This means your power-boosted observations will be optimized in regards to sharpness, clarity, and brightness for a great viewing experience. Non-marring brass compression rings inside both the main 2 inch barrel and 1.25 inch step-down adapter of the High-Power 2 inch 2x Barlow helps keep any inserted 2 inch or 1.25 inch telescope eyepiece free of scratches and thumbscrew gouges. A stylish rubber grip exterior provides a sure grip, and the 2 inch barrel features a safety recess to keep the Barlow Lens from falling out of a focuser or diagonal should the retaining thumbscrew become loose during stargazing sessions. The Barlow's 2 inch barrel is conveniently threaded for use with 2 inch Orion filters.